We've been sent the following text and pictures by Safe Speed visitor Brendan Kelly. We agree that this is an excellent example of how NOT to use a speed camera. 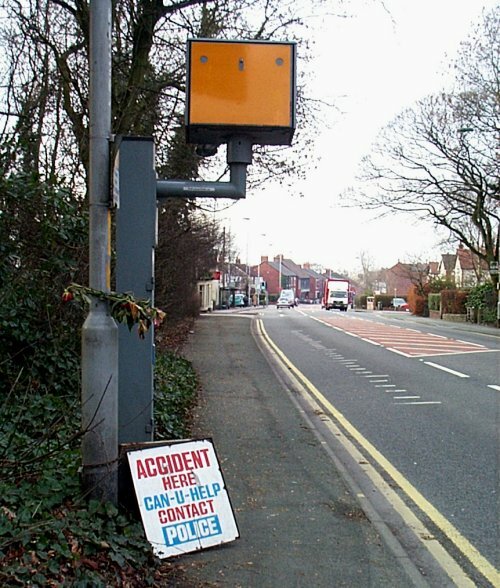 This photo was taken at 1pm on the 12th January 2004, on the A6 in High Lane, near the junction with Alderdale Drive. The CAN-U-HELP sign had been in place for about two weeks. (click here) to see a map. I don't know anything about the accident in question and I won't speculate about its cause. Looking at the flowers attached to the camera I assume there was a serious accident here and I have nothing but sympathy for those who suffered. However, to prevent other accidents this camera should be removed and deployed at a location where it can prevent accidents without creating new hazards or exacerbating existing ones. For a start, this must be one accident that the camera didn't prevent. And PLEASE can we have official signs in ENGLISH? "CAN-U-HELP" without even a question mark indeed! If there are hazards it is unwise to install a camera. If there aren't hazards it is unnecessary to install a camera. Hmm. So where are we going to move it to? One possibility is on the approach to a hazardous zone, but even then the positioning would need to be critical. 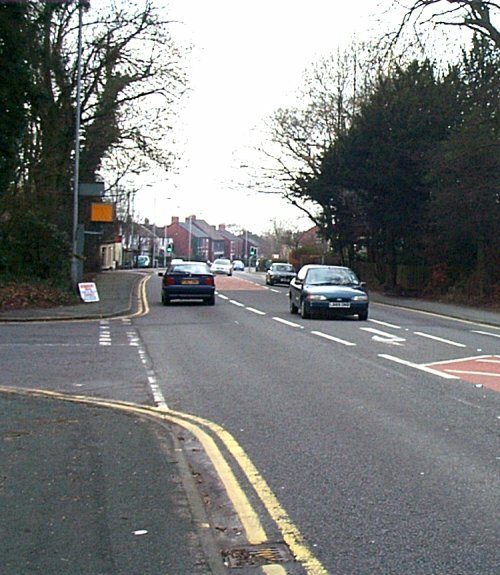 We all know that drivers soon speed up again after passing a camera - so if the camera is too far back traffic speeds may well be increasing on entry to the hazard zone. This "re-acceleration" probably starts about 100 feet past the camera. If we move the camera too far forward (towards the hazard zone) then drivers will be worrying about their speed and the camera just when they should be obtaining early observation of the hazard zone. Good forward vision is often hundreds of yards ahead. Normally these zones will overlap strongly - perhaps to the extent that even if the camera is placed in the best possible location, it will be too far back to prevent re-acceleration and too far forward not to interfere with drivers' attention to the hazards ahead.